Kirkland (Costco) Dry dog food, all breed, 1/2 – 1 cup depending on the individual dog’s needs. 1 1/2 – 2 oz meat, essential to adjust the protein/carb ratio of any commercial food, either red meat (raw or cooked) or cooked chicken or turkey. I feed mostly raw red meat, almost any cut, most fat removed. This is how I mix it per dog: I lay out all the stainless steel (never plastic) dishes and measure the dry food into them. ( I like the sloped side dishes with the rubber ring around the bottom as they are easy for the shorter-nosed dogs to get the food out of, sometimes the dollar store has them, or look in the ‘cat isles’) I then add enough tap water to moisten the food (about 50%) and let it sit until the water has soaked in, never pour off this water as whatever value the food has in added supplements and oils is topical on the food and now in the water. When the water has absorbed, I add the 2 supplements, sprinkling them on top of each dish of food, and then add the meat, chopped or cubed up on top of the food. Serve. If I have vegies, etc, I will add a bit of these. My dogs love leaf lettuce, cherry tomatoes, brocolli, asparagas, cabbage, etc. I will lightly steam to soften cruciferous vegies such as brocolli as dogs can’t break down cellulose well to get the benefit of eating these. Some grind finely in a food processor. My dogs also love strawberries, raspberries, mangoes and more. REMEMBER: NO GRAPES, RAISINS, CHOCOLATE, MACADAMIA NUTS-these are poisonous! 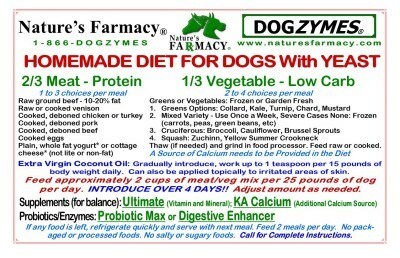 Anytime my dogs are under any sort of stress, esp one that causes any loose stool or digestive upset, I immediately double the Probiotic Max for a few days to help keep the gut bacteria balanced and healthy. I have well water. Never give your dog chlorinated or flouridated water. It’s bad for us, way worse for them. My dogs all drink out of dog water bottles. This keeps faces dry, the floor dry and mom happy. No playing in the water bowl, no spills, etc. I use the Lixit 32oz (not the 44oz or 64oz style) water bottles in holders or the crate style adapters such as Madan or Cinoton. My favorite training treats are a pet food called Fresh Pet Select, (Chicken/Vegie formula) sold in the 5 # pouch (Albertsons or other stores in a cooler in the dog food isle). They are firm, round shapes slightly larger than a pea (not the shredded style). I can break them into tiny tidbits with no mess if I’m training, toss them for training games, no mess, and most dogs love them. They are also healthy. I buy the largest bag I can find and keep it in the freezer. I keep a small zip-lock size in the fridge; they last for a week or two. 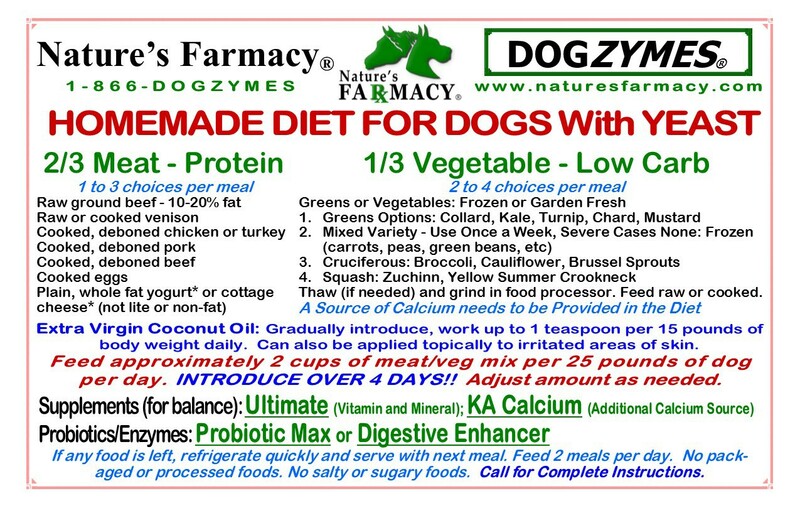 If you go to a pet store and buy a cute little package of treats, about 4 oz for $4, you are paying $16/lb for dog treats. I cook, dice and dry beef or elk liver (or hearts, but they are greasier). My treats are the size of a small pea. Throw them in the freezer in zip-lock bags. Cooked roast beef or chicken is cheaper and healthier than package treats. String cheese is great for puppies. I don’t like hot dogs; they are slimey and not healthy for dogs or people. I DO NOT buy the little milk bone style biscuits. They are full of wheat and sugar and the colored ones are atificially colored; pure garbage. The fake pepperoni or bacon treats are all fake flavored and not healthy either. Keep it simple, treat with real food. If you are doing a lot of training, you can use up to 25% of their daily calories in training, just adjust their dry food down a bit. My dog’s hair is cared for the same way I care for my own hair. Having said this, I don’t like products that have skin drying, clogging ingredients or unhealthy chemicals in them. While there are many great products on the market that are all natural and healthy, there are many more that are not so great and I avoid them all. If I wouldn’t want to eat it, I don’t want to put it on their skin (or mine). Bathe as needed every week or two or less between trips to the groomer. Hopefully you are going to the groomer no longer than every 6- 8 weeks. Shampoo and Conditioner: I use Unicure. (It’s very inexpesive & I make no money sharing this with you) I use a small amount of shampoo in a small sink or basin, wash dog with warm water, rinse well and then I add about 1-2 tsp of conditioner to a 2 cup measuring cup, add warm water, stir with a wisk and then pour over the dog, soaking all the coat. I then squeeze the excess out and towel dry. If you blow-dry the coat, keep the heat on low as it is the air flow that dries and you can easily burn them. I do not rinse the dog (or my hair) any further. This conditioner can also be used on people as a skin conditioner and so is very safe and light-weight on the coat. It eliminates static without being heavy and attracting dirt. If, while brushing, you have a bit of static based upon your climate, mist a bit of conditioner (10% or so) diluted with water in a fine mist spray bottle. Mist, don’t spray or soak the coat. Brushes, Combs, etc: For everyday brushing I use a soft pin brush WITHOUT ball tips (which can pull out hair). I prefer Madan Brushes. For a comb, I like an aluminum or stainless steel comb, sometimes called a greyhound comb. For around the faces and arranging the hair, I use a plastic (not metal) fine tooth pin comb from Sally’s Beauty Supply. To trim in small places such as face, feet or bums, I prefer a 3-5″ ball-tip scissors. I prefer the nail trimmers, not the guillitine style cutters. I have never bothered with dremel nail tools, no reason, just never bothered. I’ve never seen the need. Brush as needed, esp the ears and tail to prevent tangles. Beware of collars and harnesses tangling the coat. It can happen fast and these tangles can be a pain to get out. My dogs are trained without a leash 1st, but for safety I will use a flat buckle collar and a 6′ lead if necessary, or a harness. The nicest of all harnesses in the Freedom Harness (esp for large breed dogs). I am dead against flexi-leads. They are dangerous and actually encourage dogs to pull. They are not allowed in my training facility. 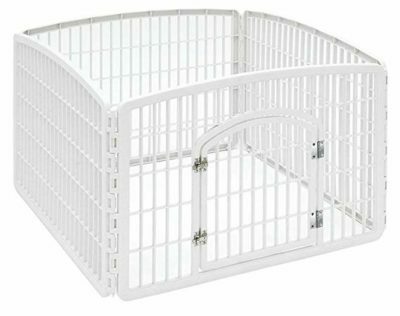 Approximately 18″ x 24″ is a decent travel size crate or for housetraining. An exercise pen or an Iris pen about 24″ – 30″ tall is usually high enough.